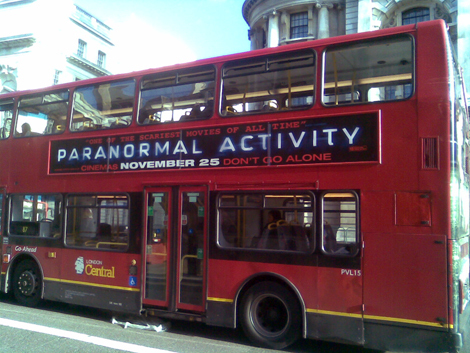 I know that crap movies posters are pretty much par for the course on the side of buses, but this Paranormal Activity one that’s been doing the rounds in London over the last couple of weeks really takes the biscuit. I mean seriously, in what way is it even remotely acceptable to have a poster that is literally just a couple of bits of text? And not in a high-concept Antichrist-style way, but in the most mundane obvious way imaginable. It looks like a bad Tony Scott film, when in actual fact it is totes wicked.